Even though Aqours have made it past the Love Live preliminaries, Uranohoshi’s not out of the woods just yet. When You points out µ’s had already managed to save their school at this point in their career, Chika starts pondering why µ’s managed to succeed where they failed. Shiver me timbers, September sure feels a heckuva lot like July, doesn’t it? The sun shows no signs of taking its scheduled break and Love Live! Sunshine!! has gone all the way back to flagellating at the altar of its illustrious predecessor. It’s as if someone took the script for what was originally planned to be episode 5 and had it hastily rewritten to fit as the show’s penultimate episode. The result is strange, entirely pointless filler that reiterates morals I’d considered over and dealt with a couple of episodes ago, and ultimately takes a narrative step backward by making explicit an evolution any viewer with half a brain could’ve deducted on their own. After all, didn’t our main characters realize that blindly following Muse µ’s would eventually just end up hurting their plight, like, three episodes ago? You know, at around the same time when Sunshine finally decided to stop being about how like or unlike Muse µ’s these new characters are? If the show’s all grown up, why are we going back to its awkward teenage years? Or have I just been giving it far too much credit to begin with? It’s a fascinating notion to consider. I’ll be the first to admit that I’m as susceptible to confirmation bias as anyone else, but Love Live truly had me thinking its sudden surge in quality after the big zero incident was intentional. That it wanted to show viewers loud and clear that Muse’s µ’s’ era was over, and that trying to make the exact same lightning strike twice wouldn’t work. In these last few episodes, the Aqours girls had mostly grown out of their prior occupations as second-rate stand-ins for Nico, Maki and co., and with a lineup of overall more solidly written episodes made perfectly clear they don’t give a damn anymore about being compared to their idols. After an early run of desperately pleading for the audience’s love despite knowing full well that it’d never be able to replace its predecessor, the newly confident Love Live! Sunshine!! we’ve been seeing for the past few weeks, was a breath of fresh air. But with this episode, the show that learnt not to care about what grumpy Muse µ’s purists think has awkwardly lapsed back into its old habits, in a shameful display of Stockholm syndrome that future viewers might as well skip. It’s a pity, because like last episode, this episode at least started out with the potential of turning a sloppy stock plot into something a bit meatier. 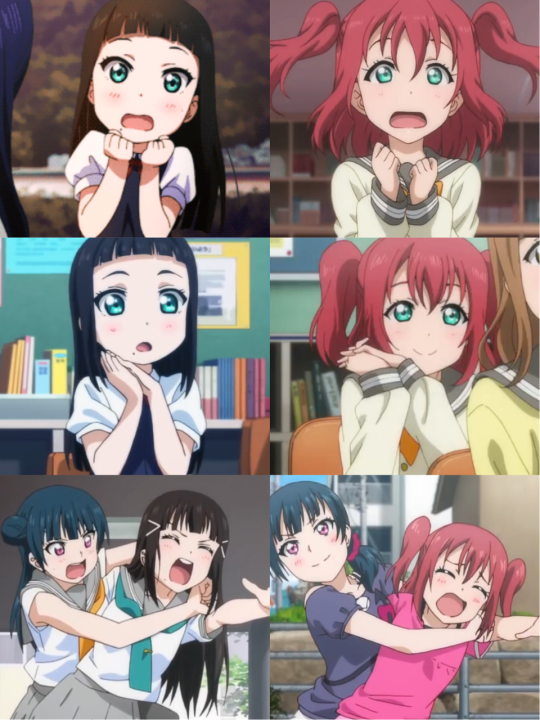 When You mentions that Muse µ’s had already saved their school at this point, Chika and Kanan’s reactions make obvious how far our main characters’ admiration of Muse µ’s has evolved over the course of their own career, from the shameless imitation of Sunshine‘s earliest episodes to something very akin to acceptance at the start of this one. Thanks to Kanan’s first ever positive contribution to the Aqours project, Chika seems ready to admit that the reason why Aqours will never quite reach the same legendary status as Muse µ’s is entirely out of their control. School idols simply aren’t as new a phenomenon as they were when Muse µ’s made it big, and a group from East Jesus Nowhere would obviously be having a harder time getting attention than one from the very centre of Tokyo. It would have been a nice reminder of how far we’ve come if the show had simply left it at that, or even better, an incentive to highlight Chika’s character development by stirring up conflict between her pragmatic new self and the impulsive fangirl she used to be, but unfortunately, Love Live passes on both opportunities in favour of some old habits that die hard. Another little tidbit this episode could’ve built an entire narrative around is the degree of irony involved in Aqours’ admiration of Muse µ’s. Though I’ve never seen the original Love Live!, people who did were quick to point out on social media that Muse µ’s never quite achieved the many great feats Aqours likes to attribute to them. Their strict training schedule Dia managed to ‘acquire’ in episode 10, for instance, was apparently never actually used, and if the many screen shots of Honoka and co. bawling their eyes out are to be trusted, saving their school and winning Love Live wasn’t exactly as easy for Muse µ’s as You likes to make it look either. Rather than acknowledging that Muse µ’s were just as dorky and seemingly incompetent a bunch as Aqours are, however, Sunshine in stead doubles down on the beatification, with the scene of Aqours quite literally praying at the site of Muse µ’s alma mater and meeting some kind of mysterious reincarnation of Honoka as the embarrassing cherry on top. Who’d have guessed making an episode about a new generation trying to cut ties with its predecessors without ever admitting that maybe, just maybe, Muse µ’s weren’t literal deities, would turn out to be a complete disaster? If the franchise higher-ups truly do insist on not letting Aqours step out of Muse’s µ’s’ shadow, they never should have given them the chance in the first place. And so, Sunshine‘s wavering as it enters its final stretch leaves us with an episode stuffed with plot threads and resolutions way past their expiration date, ending on a dubious bit of pomp and circumstance so obsessed with being inspirational that it often forgets what it is even trying to say. In order to be more like Muse µ’s, we must be less like Muse µ’s? In order to be less like Muse µ’s, we must be more like Muse µ’s? If we want to save our school, we should just shine and run on ahead? Easier said than done. Regardless of its proselytizing nature and confusing wording, though, the biggest problem with this episode’s big moral remains that the very same message had already been conveyed in a manner far clearer, far more poignant and far less insulting to the audience’s intelligence, back when Aqours had their first experience with that dreaded number zero. And that’s only the first of many things this episode recycles from earlier installments: Another trip to Tokyo, another pointless meeting with Saint Snow, another team spirit exercise on the oh-so-beautiful beach and yet another boring speech about how cool and how cute and how great Muse µ’s were; it’s all stuff we’ve seen done before, and done better. The entire thing feels more like a greatest hits do-over of key moments in Aqours’ career, only with Dia, Mari and Kanan along for the ride, than like any kind of step forward on the the group’s path, and with only thirteen episodes to develop a cast of nine, an unapologetic rethread like this one is not a luxury this show can afford. Like a beaten dog running back to its abusive owner after managing to escape, Love Live! Sunshine!! has returned to the manufactured melodrama of its early days, setting up what will inevitably be a histrionic ending built on the ashes of the goodwill it’s managed to acquire over these past few weeks. Bummer. Now’s probably a good time to point out that the only reason why Muse µ’s were ditched in favour of Aqours is because their voice actresses’ contracts expired and the suits wanted to replace them with cheaper, younger actresses less likely to get involved in some ‘scandal’ or another. Thanks, capitalism! Attentive viewers have already figured out that in flashbacks, many of little Dia’s mannerisms resemble Ruby’s, but this episode teaches us that the sisters used to share even their speech quirks. Pigii! When mentioning that Saint Snow remind her of what she used to be like two years ago, Kanan probably meant to say she thinks they’re overachieving idealists, but a more accurate and immediate interpretation would be that she’s calling them vicious jerks. I see Riko has greatly expanded her collection of not-explicitly-gay-but-not-indisputably-straight-either doujinshi (or if you’re watching the dub, ‘romance novels’). No anime without character popularity polls, and the several surveys that have ran in so far all put You, Yohane or Hanamaru in the very top spots. Looks like Love Live! fans might not have such bad taste after all. Than again, any poll that doesn’t put actual sociopath Kanan Matsuura dead last might as well be invalid. With the mention of all Muse µ’s members having graduated high school, it is confirmed that Sunshine takes place at least three years after the original Love Live! Nevertheless, all the in-universe depictions of Muse µ’s we’ve seen so far shows them looking the exact same as they did when they were still teenagers. It’s almost as if idols are not allowed to age or something.